Giannis Antetokounmpo scored 34 points and grabbed nine rebounds before leaving with an apparent lower leg injury in the Milwaukee Bucks’ 128-118 victory over the Clippers that snapped Los Angeles’ six-game winning streak. 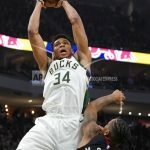 Antetokounmpo went to the floor and held his right ankle after dunking the ball with 7:46 left in the game, and he immediately went to the bench and didn’t return. Khris Middleton had a season-high 39 points as Milwaukee won its fourth straight. The Bucks open a three-game trip in Atlanta on Sunday before finishing the season with three home games.